Our aim is to make distance learning as accessible as possible - allowing you to get the skills, training and education you want in a flexible way. ICS Learn is the world's most experienced distance and online learning organisation. We have been a pioneer in teaching skills and qualifications at a distance for over 127 years, giving you the opportunity to learn while earning and to fulfil your ambitions. Our aim is to make learning as accessible as possible, allowing you to get the skills, training and qualifications you want, in a way that lets you decide when, where and how you learn. Whatever your objectives are, we are here to help, support and guide you through your journey. ICS Learn offers a range of over 60 online learning courses. From practical skills to professional qualifications, ICS Learn offer home-study courses in areas such as accountancy, finance, human resources, learning & development, marketing, teaching assistant, engineering, health & social care plus many more. Choosing to study online demonstrates to potential employers that you not only have the necessary knowledge, skill and understanding to undertake set tasks, but you can also manage your time effectively, are self motivated and already have a good work ethic - qualities that make you stand out from the crowd. The ICS Learn Student Community has been designed to allow students to interact with, and learn from other ICS Learn members and experts. Through this community you will be able to access your course materials, share information, post messages in forums, browse our resource library, and voice opinions through our student surveys. As a student you have 24-hour instant access to your account, course information and course materials. Plus you can enjoy improved interaction with your tutors and submit test papers online. I graduated University in 2015 after studying Marketing with Events Management, and instantly found employment as an Account Executive for a creative marketing agency. Whilst I loved the idea of being creative, managing lots of projects and pitching to clients, I soon realised that I was completely out of my comfort zone. Group projects and creative brainstorms would give me horrendous anxiety. I dreaded going to work. 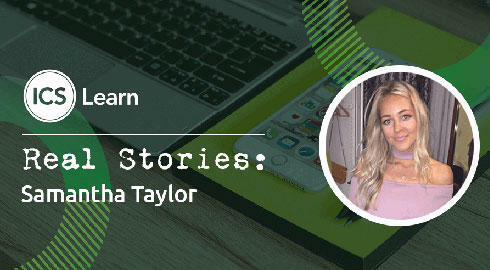 But I’d never known anything different – working in media and marketing was something I always thought I wanted to do, and I didn’t like the thought of wasting my degree. It wasn’t until I got into the invoicing and accounts side temporarily that I discovered that whilst I’m a very sociable person, my working style was very different and I much preferred more solitary tasks and problem solving. It’s important to love the job you do. Because of this I decided to take the plunge and make the career change. There wasn’t a permanent accounts role where I worked, because it was such a small company, so I began looking for another job. I was extremely lucky to gain employment as an Accounts Assistant, without having any prior experience. I instantly settled into the role and was certain I’d made the right move, so I decided my next step would be to study for my AAT qualifications to gain the knowledge and confidence I would need to progress. Full time work and other commitments made it difficult to go back to University or college, and I loved the idea of being able to work at my own pace, so I chose distance learning instead. ICS Learn stood out to me due to the level of support you get, the positive reviews I read online, and the payment plan. At first, I wondered whether I’d made the right decision with distance learning. I was struggling to understand certain concepts without having a “teacher” to explain, but the student forums on ICS have been amazing. I persevered and passed my first exam with 89%. It has been the best motivation to prove that I can do it and keep me going. My GCSE maths teacher would find it hilarious that I’ve chosen a career in accountancy, given how much I hated maths at school, but when you choose what you study and how you study, it makes a huge difference. The most important thing with distance learning is to constantly remind yourself of why you are doing it - this will always drive you to continue and reach your end goal. I've definitely caught the study bug again, and I’m excited to eventually progress onto the Professional Level with ICS Learn and open even more doors in my career.